Twenty Eight: Holy Technical Issues Batman! “Jupiter Ascending” discussion. All argue; hilarity and hurt feelings happen in equal measure. Chris and his wife Susan are rewatching “Stargate SG1”, nostalgia abounds. Chris is binge-watching “Spartacus: Blood and Sand” which is really quite entertaining, hyper violence and hyper T&A. Patrick re-watching “Star Trek: Voyager” with his Partners In Crime and Friends of the Show Shane and Gabby. Andrew is current with “Batman: Eternal”. The series is wrapping up in the next few weeks and he is excited to see how it resolves. Christopher is only slightly behind with “B.E” and is re-listening to the Dresden Files for the third time. They are his go-to audio books for the car. Patrick has downloaded “A Dance with Dragons” on Audible. It is almost as long as Britney Spears’s first marriage. Destiny Weekly Nightfall Stike is run by the Brothers Geek Fire-Team. We got that radiance! Christopher plays “Evolve”. The game’s Monster vs Hunters clashes are satisfying, the controls are not immediately intuitive though. Patrick plays “Forbidden Island”. His board game foray continues. He hasn’t encounterred a bad one yet. Name all of Lord Voldemort’s Horcruxes. It’s too easy again. We agree we must attend a bar trivia night and dominate. 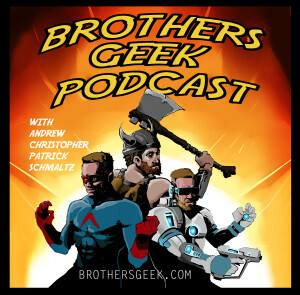 This entry was posted in Podcasts and tagged A Dance with Dragons, Destiny, Marvel on February 20, 2015 by BrothersGeekadmin.